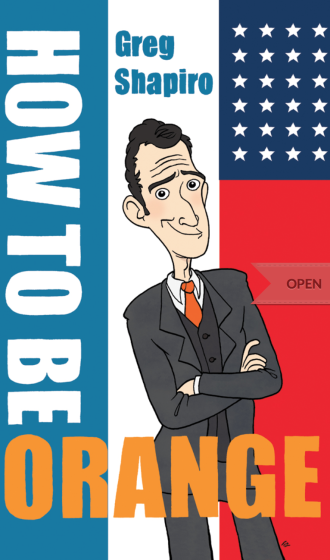 How to be Orange, offers an insightful look at Dutch culture by social commentator and comedian, Greg Shapiro. Shapiro’s extensive knowledge of Dutch culture and politics has been accrued over twenty years of living and working in the Netherlands. His cultural immersion has involved marriage to a Dutch woman and parenting first generation Dutch children, while living in Amsterdam and forging a durable career within the local art scene. In the Netherlands, Shapiro is the immigrant people laugh at. He happily accepts this fate, not just because it is how he makes his living, but because it indicates that his efforts at inburgering have been a success. Shapiro is an American, obvious in many ways including numerous comparisons of the Netherlands to the US throughout the book. His birth culture is the basis for what formulates his views about his adopted land. An example is chapter 22 on Dutch service, renowned for being non-existent if you are lucky, and terrible if your luck is running short. Shapiro rates service in North America as sitting on the other end of the hospitality scale – something akin to being downright annoying due to desire of earnest staff to increase their tips by attentive servitude. The book is the offspring of the author’s stage show, and hence the material has been tried and tested in terms of relevance to the audience/reader experience. Newcomers to the Netherlands will identify with topics like dealing with government bureaucracies that don’t make sense acquiring a cheap, used bike from unscrupulous sources feeling insulted by Dutch honesty and the irrational love of Zwarte Piet in a land that is otherwise unable to gracefully accept racial differences into its mix. Difficult topics are tackled with facts, sharp insights and often hilarious, personal anecdotes. Presented in two parts, part one contains 24 short chapters interspersed with caricature illustrations of Shapiro by Floor de Goede, and photos of Dutch things that become laughable in translation. Part Two is the Assimilation Exam, a list of questions and answers used in the National Inburgering Test, a test of Dutch cultural understanding for foreigners. This second part emphasizes the idiosyncrasies of Dutch culture that are difficult to understood even for the Dutch, yet can be found in the examination questions for newcomers. Again, Shapiro addresses the odd image the Dutch have of themselves, compared to how the world sees the Dutch. A good example is the multiple choice question about where Dutch people go on holidays (p235). The answer that is officially correct is: A) The Netherlands, yet Shapiro states that the true answer is actually: B) In France and Spain. Most Dutch people, and camping ground staff in France and Spain, would agree with Shapiro. How to be Orange is not an official guide book to Dutch culture, yet the inclusion of this book on the essential reading lists of cultural assimilation courses would save newcomers unnecessary frustration in understanding their host country. For the rest of us, the book is a compendium of humorous subjects presented with respect, wit and sarcasm by an American with a strong attachment to the people and culture of his adopted homeland.